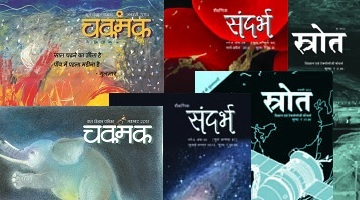 Chakmak: A monthly literature and science magazine published in Hindi from India for children, which gives space to their own creativity as well. Created for kids 11-14 years old, it ignores stereotypes by treating children as sensible beings, speaking to them in a language of equals. Sandarbh: A bimonthly Indian magazine published in Hindi for school teachers on science and education. A resource bank for teachers, it serves as a repository of innovative pedagogical methods to be tried out with kids, and teachers' classroom experiences in addition to articles that explain a range of curricular and related topics. Srote: A monthly compilation of news and features in science and technology from around the world, published in Hindi from India. These articles are part of a weekly service that provides reliable, quality material newspapers and magazines in a language palatable to their readers, which can include children as well as adults.